Are you in the Spiritual Closet Lightworkers + Empaths? There have been many times I felt like I was waiting on the sidelines of my own life. That is a strange perspective really because we are always living. Right here and right now, there really isn’t any sidelines. BUT the sidelines are a feeling. It’s a feeling of missing out, or not doing something you want to or should be doing. This feeling certainly plagued me in the past. Most of it felt like I couldn’t fully express myself in the way I desired in the world. The root of it was, on some level, I was hiding. I was hiding in my spiritual closet. A place that was safe and no one could actually see me. Have you felt that way, or do you now? On the one end, it is about learning how to express yourself in the way you want to express yourself. For example, if you want to write from your heart, it might take some practice and repetition to do that and to feel fully open and channeled in that way for you. On the other end, it is about being ok with being you, and being visible. Visibility doesn’t mean shouting from the rooftops or being the most outgoing person in the room. It means allowing yourself to be seen as YOU, which is unique and vast and layered. 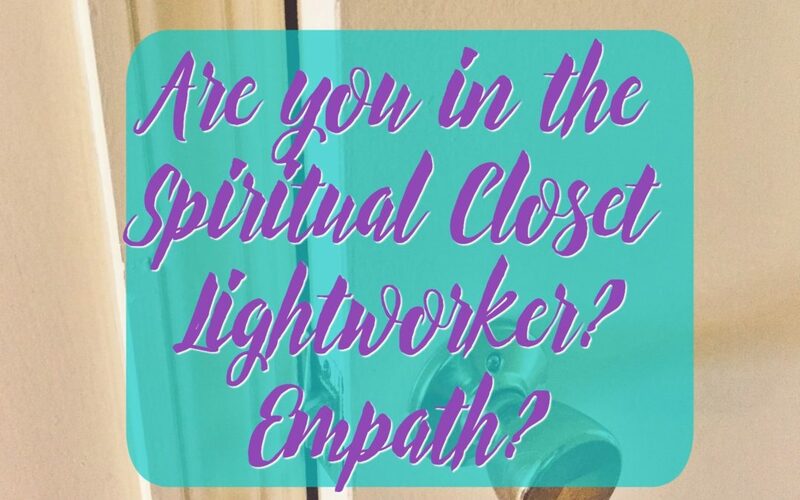 As lightworkers and Empaths, the spiritual closet can be a great place to hang out! However, have you been feeling like hiding isn’t aligning anymore? Yes, it isn’t all or nothing. We come out of the closet around those that we know for sure are ok with who we are, then we go back in around other people….or have the door open with one foot in and one foot out. It is an energetic thing. It isn’t necessarily about verbally expressing what your beliefs and experiences are, it is about energetically hiding. The thing is, right now the time of awakening is accelerating rapidly. Lightworkers and Empaths are feeling a deeper or more urgent call to do something. 2: Has known you are a lightworker for a while, however, you haven’t fully hit the mark with what you are meant to be doing. You have tried many things, read many books, and taken many classes, yet you still feel like something is missing and that is frustrating because you know you are meant to be useful in some way and you are ready to fully channel your energy into being fully YOU! 3: A lightworker who is hiding in the spiritual closet and wants to fully step out because you KNOW you are meant to be a leader in a way you are not embodying at this point. 4: Is a seasoned lightworker who has been clear in their mission and purpose and has been living it for a while feeling fully aligned… however lately something isn’t quite fitting anymore. You are being called to change and that can be scary and unsettling even if it’s exciting too. Your mind questions this change because it is unfathomable that after all this time you feel called to change everything that worked so well for you. Yet your BEING knows you are birthing a new reality for yourself. Which way are you going? I understand you, regardless of where you are at, in this moment and I can help you if you feel called. I’m definitely one two and three. I know I have empathic gifts something of premonition but not really in a way that you could control. I can manifest little things that I like but I’ve had trouble getting through blockages of manifesting the job I want or my passion. I’m kind of lost in that sense but I know I’m I’m a very good energy and my friend said that someday in the end I would be in the great crowd lifting everyone up. Said that I was someone special. I am glad you identify with points 1,2,3 and that you know you are an Empath! It is great to know we are not alone in all of this right? We are always manifesting but consciously manifesting what we want can take a bit of practice. Awareness of where we are stuck is always “step one”. Then there’s further clarity needed to keep releasing and shifting what appears to be holding us back. Hang in there, Laura! I can help you understand and hone your gifts and help you move through those “blocks” if you feel called. Check out my Mentoring under the work with me page.